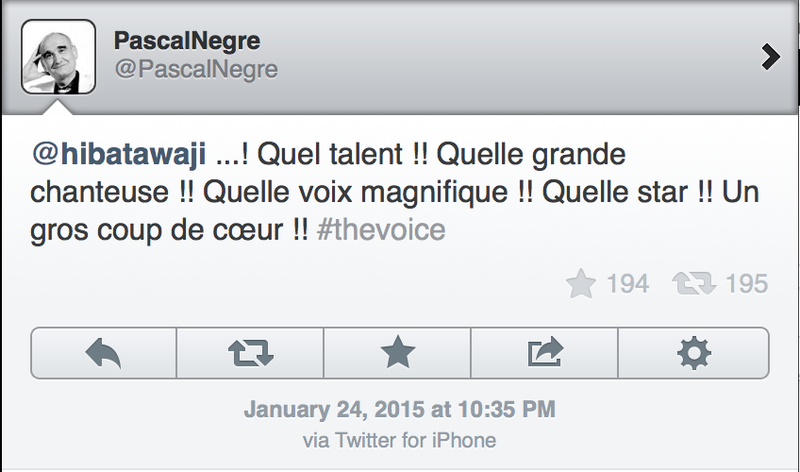 Hiba Tawaji just blew everyone away at France’s The Voice, as was expected. She started off singing Michel Legrand’s “Les Moulins De Mon Coeur” before going into her own Lebanese version of the song “La Bidayi Wala Nihayi” prompting all four judges to turn for her. Hiba then continued singing effortlessly before ending her performance with a high note that got all 4 judges to give her a standing ovation, as well as have the audience attending the taping rise to their feet to applause her. She ended up choosing Mika as her coach for the rest of the show. I saw a lot of Lebanese people wonder how it makes sense for someone as accomplished as Hiba Tawaji to end up on a French talent show. I think someone as talented and as vocally adept as Tawaji is limited by the scope of what she can do in a country like Lebanon. Her talent can easily find a place in an international scene, with France being the easiest stepping stone as The Voice has proven to be receptive for Lebanese talents as Hiba Tawaji is the fourth Lebanese in four seasons to participate. Sure, participating in a talent show doesn’t necessarily translate to instant success, nor does it mean she is sure to win the show. But if there’s any Lebanese that can have a shot at reaching the finals (the best outcome so far was Anthony Touma reaching the semi-finals in season 2), it’s her – and her audition only serves to prove that point: out of all 4 Lebanese, she was the best by far. Moreover, Hiba Tawaji has been around for several years now, and her state of success, albeit impressive, is easily dwarfed by much less talented but more busted female singers in the country, which means that she is quite under-appreciated here for the level of art she is presenting. Naturally, there will also be those who tell us that there are more important things to worry about. Of course there are more important things that Lebanese should be preoccupied with. At times like these when our army soldiers are bravely dying to let us watch such TV shows safely in the confines of our homes, and when there’s little to be optimistic about at the state of the country actually, such a moment can serve to unwind. And that’s not really a bad thing. The French are referring to Hiba as “la Libanaise.” She represents us and is doing so extremely well. As such, Hiba Tawaji has made us all proud today and best of luck to her progression on the show. This entry was posted in Lebanon, Music, TV Shows and tagged France, Hiba Tawaji, La Plus Belle Voix, Lebanon, music, The Voice, The Voice France. Bookmark the permalink. Well .. you left us no word to talk about it! hiba was fantastic as usual. We’ll be waiting her next song that will stun them. Too bad that this seems to be the best way for some Lebanese artists to get recognized in France. Un sourire est Beaucoup mieux qu’une Bouche en cul de Poule.